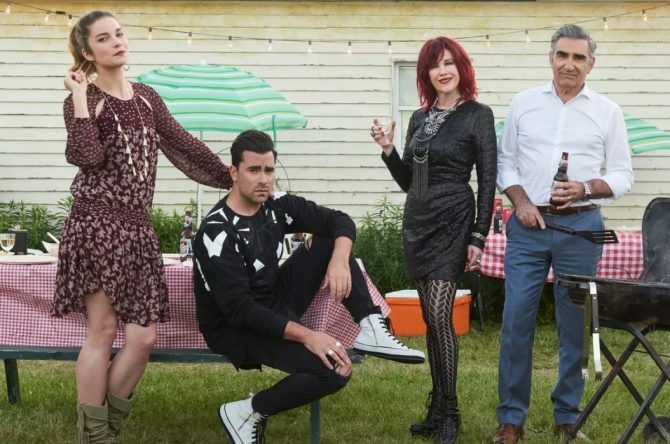 It took several glorious seasons of Pop TV’s Schitt’s Creek, the brainchild of Daniel and Eugene Levy, for US audiences to fully catch on to the show’s brilliance. And just as soon as America re-upped its love affair with Catherine O’Hara thanks to her absolutely genius run as “Moira,” the wig-loving matriarch of the Rose family, the show is leaving the airwaves, or streamwaves, or however you crazy kids watch TV now. But the news isn’t entirely bad. In a written statement, the show announced it would come back for a sixth season (yay! ), but that it would be the series’ final one (aww). Throughout its five seasons, the often-zany series helmed by breakout star Daniel Levy has taken on some frank and unconventional queer storylines. Daniel’s character, “David,” has been celebrated as one of TV’s first and most visible pansexual characters. And despite being a screwball fish out of water comedy, the show has handled its more earnest endeavors with total class. Seasons 1-4 of Schitt’s Creek are available to stream on Netflix. A fantastic show. I’ve watched and re-watched the David / Patrick romance arcs over and over again. And I like the decision to keep homophobia out of the show – David sometimes gets criticized for being overly fussy but mostly just in the same way all the other characters do. Fun show. Yes Patrick serenading David is cool and wonderful. David’s character is kind of like Kimmy’s roommate Titus with a different over the top reactions. And Patrick is cute. One of Carol Burnett’s favorite shows. Such a well written and equally acted show. Congratulations to Dan and Eugene Levy and to the entire cast. You made me laugh and smile. While sad it’s ending, at least we’re getting a definite 6th season. Great ensemble! So glad I found this outstanding show early on. Daniel, thank you very much for how you’ve approached our people…and, do it while keeping me fascinated, mesmerized, laughing and crying. Who knew seeing an adorable, confident(? ), aggressive gay boy first, actually hit the ball then proceed to ‘not so prissy’ run the bases. David was even up for getting his suit dirty by sliding into home in spite of his dad hitting him in the back with the ball. This episode is on Replay. Now I have another reason to live. Eugene and Daniel Levy’s onscreen relationship provides healing joy: a nurturing straight Dad embrace of a scarred/scared-by-experience gay son’s relationship is nothing short of therapeutic. Daniel Levy’s face manifesting unexpected bliss hearing Patrick sing a ballad publically devoted to him in a small town setting sends hope to many young “ew, David[s]”.